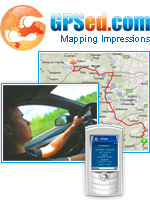 GPSed - location-based service for trip tracking from mobile. In real time tracks are traced on Google maps and stored in an online archive. With a simple geotagging feature it is possible to pin photos to a map precisely at a place they were taken. Record tracks of your trips anywhere on the Earth from your mobile phone. Tracks are traced on Google Maps and stored in an online archive. All you need to start tracking is a mobile device with an internal or external GPS receiver. Take photos while traveling and link them to a map precisely at a place they were taken. The geotagged photos will be stored on your computer for easy and private access. See your geotagged photos in one click on Google Earth. You can get free desktop service GPSed Photo Take´n´Pin on gpsed.com. Sharing your trip impressions with friends is easy. Just select "Email to Friend" and your friends will receive a link to your public tracks. Let your friends see your instant position on a map when you are recording tracks with GPSed. Open/Close tracks to view them. Search among your tracks and public tracks of other users. GPSed mobile application is fully compatible with BlackBerry, Windows Mobile (Pocket PC and Smartphones) and Java phones with internal GPS receivers or external Bluetooth GPS receivers. Owners of standalone GPS receivers and GPS navigation software can upload tracks in GPSed for organizing them in an archive and sharing with friends. For BlackBerry and Windows Mobile handhelds Pro version of GPSed is available. All features that you have already got accustomed to use in GPSed free basic version you will find in Pro, but new features make this version really efficient.